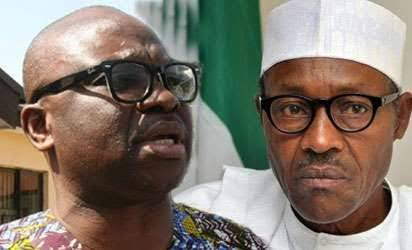 Ekiti state governor, Ayo Fayose, yesterday said President Buhari is too old to rule Nigeria and that he is like his grandfather. Fayose said this while speaking on the topic: “Journalism and Politics; two sides of a coin,” at the World Press Freedom Day organised by the Nigeria Union of Journalists (NUJ), Oyo State Council, held at the Dapo Aderogba hall, Iyaganku, Ibadan yesterday May 3rd. “President Buhari is too old to rule this country and that is why there is problem in this country now. He is like my grandfather. Nigeria should not produce any president that is over 60 years. "World democracy don’t parade octogenarians again. Young people should rise up to challenge the older generation. Maybe that is why there is a law that a pilot should not fly an aircraft after 65 years of age,” he said. Fayose at the meeting called on journalist to be fierce and sincere in their reports.
" You are the last hope of common man. When journalists support looters, there is confusion of vision. Journalists should shy away from it. Bad politicians should be brought to justice. Don’t write about issues you don’t know. Don’t rely on what a politician told you of his supposed enemy and don’t inherit his enemies. Journalists must help bring corrupt politicians to justice. When politicians are going wrong, let them feel the heat first from you. Most politicians are using journalists in Nigeria for their dirty jobs and they are supporting wicked politicians. Journalists in Nigeria always shy away from the truth because they are self-centred and greedy. As a journalist, you need to discharge your duty without fear or favour. Politicians have no address and this is why it is possible for a politician to defect from PDP after 12 years to APC and is being celebrated as a saint. Journalists should stop supporting and having soft spots for political parties and politicians. Some of you have sympathy for PDP or APC. Don’t join our battle. You are the hope of the common man and the only thing they can enjoy,” he said.